There are many excellent tutorials about Pascal, but this tutorial attempts to take the beginner further, into Object-Oriented Programming with Object Pascal, which is an extension to standard Pascal, offered by Turbo Pascal, Delphi and Free Pascal / Lazarus. Standard text-based Pascal programming is good for creating applications which, like traditional Unix applications, do one thing and do it very well. The 'one thing' that a program does might be a very complicated action, and might offer the user several menu-driven options, but it is essentially restricted to obeying commands that the user types at the keyboard and listing its responses on the terminal or a printer. In order to provide a Graphical User Interface (GUI) it is usual to invoke some sort of Object-Oriented Programming method (often making use of C or one of its variants, or Visual Basic, or one of the OO variants of Pascal such as Free Pascal with or without Lazarus). The user is expected to move a mouse or other pointer/selection tool over the screen, to select actions which are to be performed in response to a mouse button click or a key-press. While systems to deal with a complex graphical user interface could be written in standard Pascal or almost any other programming language, it is much easier to use an object-oriented system, in which each graphical object on the screen can have all its properties and the procedures and functions associated with its use kept together in a common structure. Consider the analogy of a blood sample collected in a hospital or a doctor's office. The physical sample is certainly an object; it has, associated with it, a lot of information, documents and other physical objects. Sample tube, of a type determined by the test that the physician wants performed. how to store it before transfer to the lab. the possible diagnosis for which confirmation is sought. A copy of the request form is placed in the patient's notes, to remind the physician to expect results within an appropriate time. reported back to the physician. The actual results are a record that the physician uses to assist the diagnosis, and a copy of the results is filed in the patient notes. The physical sample might be retained for reference, confirmation or further tests, or might be disposed of by pouring down the sink or by incineration; there will be a method to describe this. Enough of this pre-occupation with Real-World examples! Let us proceed to the main purpose: programming in Object Pascal. 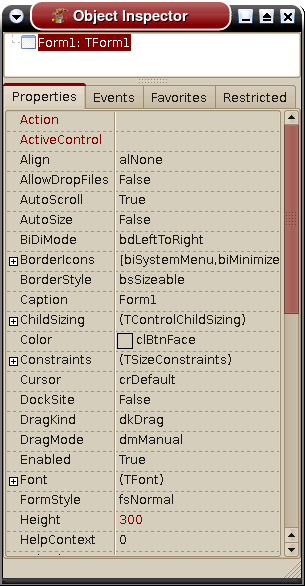 Let us consider the creation of a simple Form with a few controls for an application in Free Pascal/Lazarus. On invoking the Lazarus IDE, the programmer is presented with a blank template Form design, on which he is encouraged to place various controls or objects. Note that the pre-made blank Form is already an Object, with its own properties such as position (Top and Left), size (Height and Width), colour, default font for adding text etc. 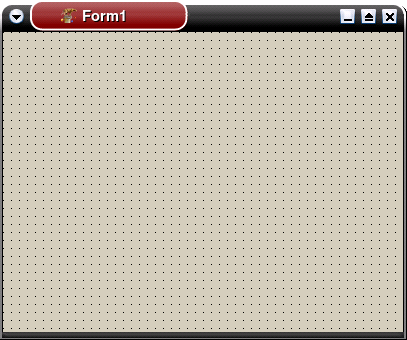 If a Button control is placed on the Form (type TButton), it will have its own series of properties, which can be examined in the Object Inspector window. Several of the properties have names similar to those for the Form; this is because many properties are Inherited from some common Ancestor class, which lays out how properties are to be defined and handled by the descendant classes. FPC includes several language extensions to its "standard" Pascal syntax to support object oriented programming. These extensions are described in the indicated chapters of the FPC Language Reference Guide: http://www.freepascal.org/docs.var. Links to tutorial pages for each concept are included above as well. The Language Reference Guide includes syntax diagrams and further details not contained in this introductory tutorial. Of the four language features listed above, Objects and Classes form the basis of object oriented programming (OOP) in FPC and Lazarus. For those new to OOP, the Objects section includes more introductory concepts and the Classes section minimizes repetition by emphasizing the similarities and differences to the Objects syntax. In general, the Classes implementation seems to be more widely in use including Delphi Lazarus developers. Often the word "objects" is used to refer to what is actually a "class" in the Classes dialect of OOP in FPC. These documents will be worded to minimize any terminology confusion, but outside of this document, the term "object" oftentimes refers to objects created from a Class. In fact, the FPC run time library (RTL) includes a class library with a base class called TObject. Users familiar with the older Turbo Pascal OOP implementation may initially want to skip the section on Classes since the Objects implementation is based on the older Turbo Pascal dialect. The section on Classes should be familiar to Delphi users since it is based on Delphi syntax. Be aware that some of the writeup in the Classes section may refer to concepts from the Objects section. For Macintosh developers familiar with the various Apple, THINK and MPW Object Pascal dialects, neither the FPC Objects or Classes dialects provide a direct migration path. As of March 2009, there are discussions on the Mac Pascal Mailing list about potentially providing some compiler support (new syntax) for accessing Apple's Objective C / Cocoa framework. OOP provides different ways to manage and encapsulate data and to manage program flow compared with other available programming language features and constructs. OOP often lends itself to modeling certain applications such as Graphic User Interfaces (GUI's) and physical systems in a more natural feeling manner. However OOP is not appropriate for all applications. Program control is not as explicit as the more basic Pascal procedural constructs. To obtain the most benefit from OOP, understanding of large class libraries is often required which can entail a steep learning curve. Maintaining large OOP application code has its advantages and disadvantages compared to maintaining strictly procedural code. There are many sources for learning OO analysis, design and programming techniques which are beyond the scope of this guide. There are numerous programming languages which incorporate OOP features as extensions or the basis of their language. As such, there are many different terms for describing OO concepts. Even within FPC, some of the terminology overlaps. In general, OOP usually consists of the concept of a programming object (or information unit) which explicitly combines and encapsulates a related set of data and procedures which act on the data. This data is usually persistent during program execution but with mechanisms to reduce some of the problems inherent in declaring global variables. In addition, OOP languages enable objects to be incrementally modified and/or extended based on previously defined objects. This feature is usually referred to by the terms inheritance and polymorphism. Many OOP languages use the terms method or message referring to procedures which belong to an object. Much of the power of OOP is realized by late (run time) dynamic binding of methods rather than compile binding. This dynamic binding of methods is similar to using procedural variables and procedural parameters but with greater syntactic cohesion, encapsulation with the data it is related to and also inheritance of behavior of previously defined methods. The following wiki pages provide a starting point for discovering more about analysis, design and programming in an object orient manner. Borland was also kind enough to release the Object Oriented Programming chapter from the original Turbo Pascal manuals in PDF form. This chapter is from when Borland introduced this new language feature into Turbo Pascal. The chapter might be old, but the OOP theory is still very relevant today. You can download a copy from the following link under the "Other" category. This page was last modified on 14 March 2018, at 20:44.